Having been in the East end for coming up to 5 years now, I’ve been waiting for what has seemingly been an eternity for a decent neighbourhood Malaysian restaurant to show up in the Aldgate East-Spitalfields area. I’m pleased to say though that the wait is finally over. 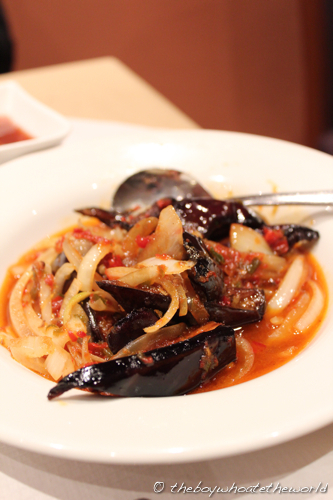 Proper Malaysian food has arrived, thanks to Brick Lane’s latest addition – Delima. So the next time you find yourself in Brick Lane, ignore the over-the-top touters offering free Cobra with your Indian curry and look out instead for this modest-looking neighbourhood restaurant which is dishing out some properly authentic Malay cuisine. If there’s one acid test to gauge the pedigree of a Malaysian restaurant, it’s through the quality of their Beef Rendang. Delima’s is benchmark quality – large chunks of tender beef…. the meat falling apart from hours of slow-cooking… and a rich coconut-based gravy that successfully combines the holy trinity of spicy, savoury and sweet flavours that define Malaysian cuisine. 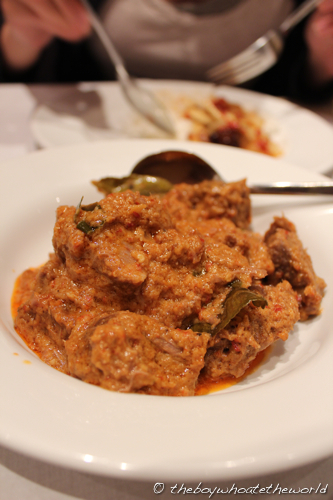 As far as Beef Rendang goes, this is as good as you’re going to get in London. 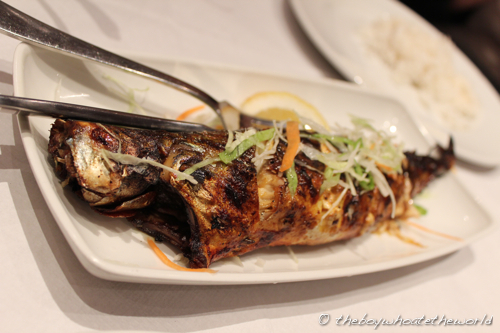 The Ikan Panggang we ordered had that characteristic open-fire grilled char and the fish was fresh, plump and moist… full of rich savoury flavours. If I had one grumble, it was that the tamarind ‘assam’ sauce that accompanied the fish could have done with more kick. Otherwise, a very satisfying dish on the whole, especially given the whopper-size of a Mackerel we were treated to. What really hit the spot though were their Fried Aubergines (Terung Goreng Berlada) which were oozing with smoky, char-grilled flavours. Their freshly ground chilli paste had that wonderful balance you get in all good sambals… a delicate yin and yang of sweet n’ spicy. Whats more, the large chunks of aubergine were cooked to just the right amount… the texture not overly firm, yet not too mushy either. Yummeh. With the bill coming up to £25 for 2, it’s all very decent value and a great budget alternative to your usual East End Indian curry. Besides the delicious food, it’s the warmth of the staff that will undoubtedly make me a regular here. It was a quiet Wednesday evening so we got the chance to speak at length with the owner Azman and his son as well as the chef (a Malay lady from Klang)… all of whom spoke openly about the philosophy of Delima and their reasons for moving away from their previous home in Paddington where they had been up and running for more than 2 years. Kim: Indeed, it’s great to have a change on Brick Lane… most of the Indian restaurants are pretty average as well in any case. Thanks for stopping by! Bav: plenty if vodka and caviar to make up for the lack of fresh fish I’m guessing? :). Tx for stopping by the blog btw . What a find! I’m not far from Brick Lane. Need to try this out STAT. Thanks! Wen: Tell me about it. It’s a proper neighbourhood gem! Yay! Great to hear about a good Malaysian restaurant opening in London. To be honest the quality at other places was beginning to wane. Thanks for sharing, the rendang looks like the real deal! @HungryFemale: Apparently they used to setup shop in Paddington but had to move because of problems with the lease there. I’ve been back a couple of times since (it’s become my local), and what is really outstanding is their Assam Pedas fish! If you get round to giving it a try, do let me know how you fare. Tx for stopping by the blog! Oooh I love Ikan Assam Pedas! Will defo have to try this out.